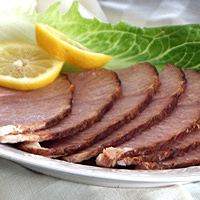 Ham is one of the most versatile and time saving meats to have on hand. Not only is it easy to prepare a large spiral sliced ham for a big sunday dinner, but the leftovers make a myriad of tasty middle of the week meals or lunches. After serving a ham, I always freeze the leftover meat in individual freezer bags so I can later thaw out just enough diced ham for carbonara or a quiche. I freeze some sliced ham as well for sandwiches down the road. None of this takes me much time at all and keeps dinner coming when I have no time to fix it! Even the hambone is great frozen because it perks up a split pea soup like nothing else. Keep in mind that even though ham is high in sodium and choleserol (see nutrition content below), it's only a minor player in most meals. You generally don't need more than 1 C of chopped ham for an entire recipe that feeds 4. Plus, freezing the meat for later means that you don't have to use up that entire ham the same week you buy it. After all, it's still a good source of protein and many of the recipes below pair ham with healthy fresh vegetables. If you are looking for a convenience food, any of these quick recipes with ham beat the sodium and cholesterol content in a fast food order by a mile, so live a little. Have some ham. With such a high salt content, a ham can actually stay fresh in the refrigerator for weeks as long as it remains in the packaging. Frozen ham is good for up to 6 months. Ham usually comes fully cooked. It can be eaten cold right from the package or baked in the oven for 15 minutes per pound at 325 degrees.